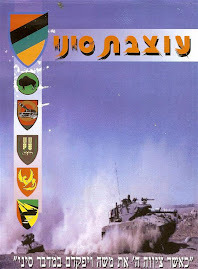 Soon will turn 40 years to the Yom Kippur War, which was forced upon Israel by Egypt and Syria on holiest Jewish day. 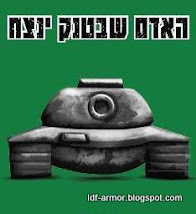 Fighting for the house was not empty word ,sacrifice was big but the IDF proved that the Arabs can't defeat Israel in battle. The war ended 101 k"m from Cairo and as 50 k"m from Damascus after pressure from the super powers . Israel’s victory came at the cost of heavy casualties, and Israelis criticized the government’s lack of preparedness. In April 1974, the nation’s prime minister, Golda Meir (1898-1978), stepped down. Although Egypt had again suffered military defeat at the hands of its Jewish neighbor, the initial Egyptian successes greatly enhanced Sadat's prestige in the Middle East and gave him an opportunity to seek peace. 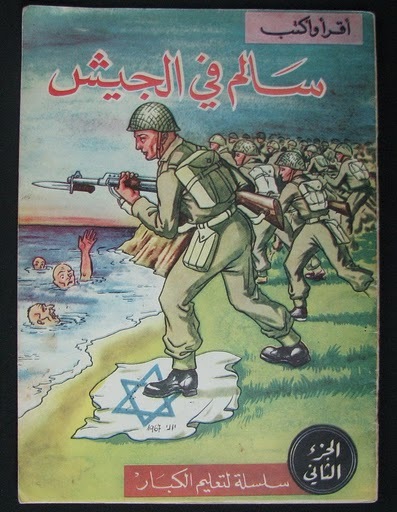 In 1974, the first of two Egyptian-Israeli disengagement agreements providing for the return of portions of the Sinai to Egypt were signed, and in 1979 Sadat and Israeli Prime Minister Menachem Begin (1913-92) signed the first peace agreement between Israel and one of its Arab neighbors. In 1982, Israel fulfilled the 1979 peace treaty by returning the last segment of the Sinai Peninsula to Egypt. 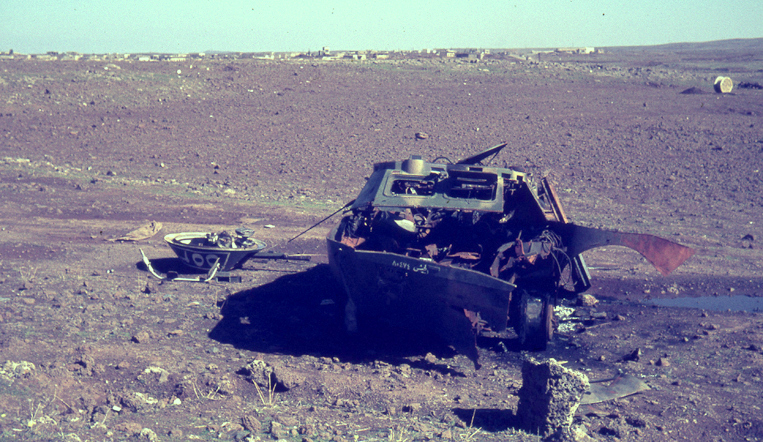 For Syria, the Yom Kippur War was a disaster. The unexpected Egyptian-Israeli cease-fire exposed Syria to military defeat, and Israel seized even more territory in the Golan Heights. 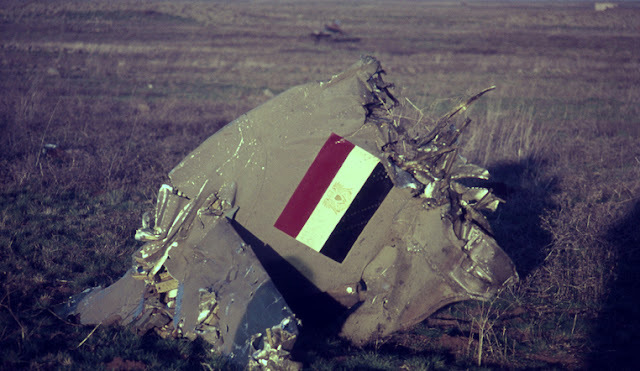 In 1979, Syria voted with other Arab states to expel Egypt from the Arab League. Defeat seemed to be imminent for the state of Israel. The Syrians' Soviet-style massive frontal assault was too much to bear, and the Israeli front lines had already collapsed. The Israeli general in charge of the entire front had abandoned his nearly surrounded headquarters (HQ) and retired to a makeshift command post a few kilometers back. 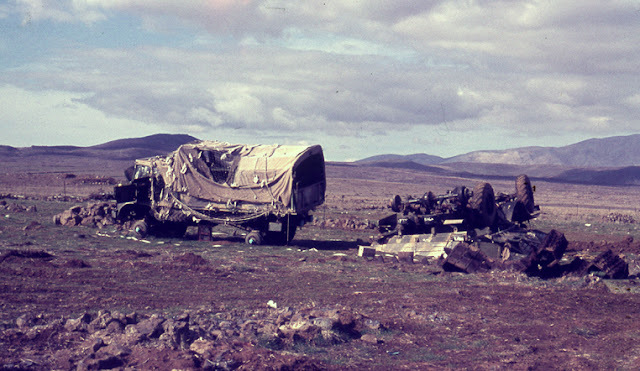 With two Syrian brigades advancing on the headquarters and no Israeli reserves in sight, defending the headquarters–left in the hands of infantrymen supported by only two trackless tanks mustered from the camp's repair depot–seemed almost futile. 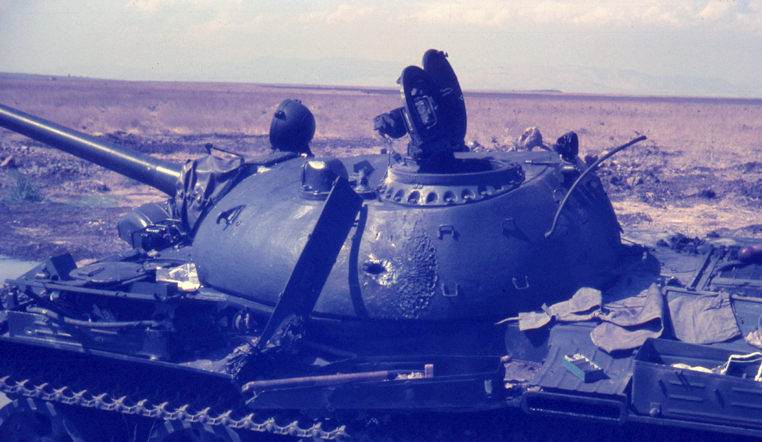 On October 6, 1973, during Yom Kippur, the holiest day of the Jewish calendar, a Syrian armored force of 1,400 tanks backed by more than 1,000 artillery pieces and supporting air power began a coordinated assault along the 36-mile-long Israeli-Syrian border in the Golan Heights in the north of Israel. 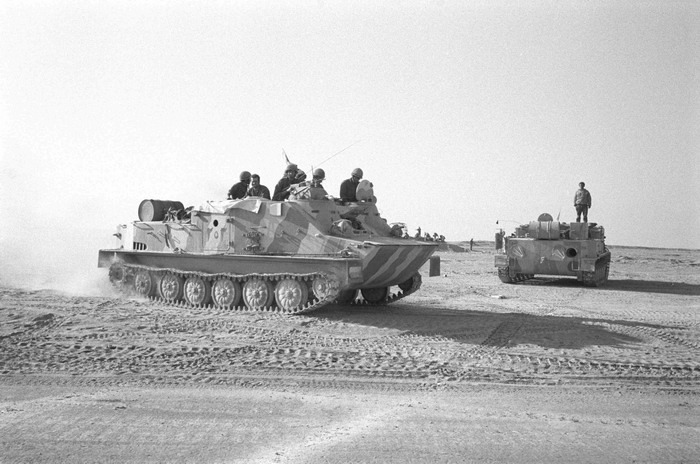 That attack coincided with a similar onslaught by Egyptian forces along the Suez Canal, suddenly forcing Israel to fight a two-front war. Israeli defense doctrine relies on the standing army to hold the line with air support while the reserves are mobilized. Therefore, the two Israeli brigades that stood in the Syrians' way in the Golan had the daunting task of holding off the onslaught long enough for Israel's reserve mobilization to kick in. The 7th Armored Brigade's epic defense of the northern Golan has come to be widely regarded as one of the finest defensive stands in military history. Less publicity has been given to the heroism of the shattered fragments of the 188th (Barak) Brigade in slowing the Syrian advance in the south. 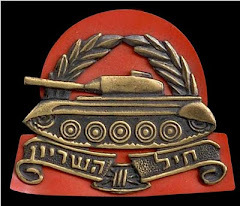 In some respects, however, the Barak Brigade's story is more incredible, considering the fact that hundreds of Syrian tanks had overrun its sector and were held off by only a handful of tanks. 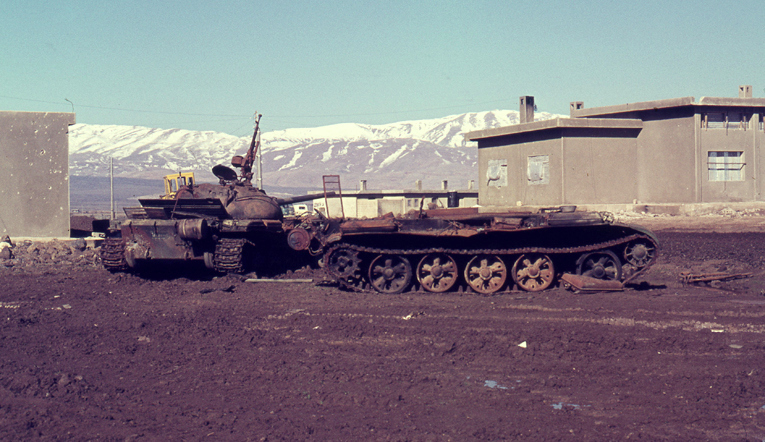 The 1973 conflict was as much about honor as it was about real estate. In the Six-Day War of June 1967, Israel had seized the Golan Heights, which Syria had turned into one large network of bunkers and artillery positions. For years, Syrian gunners, shooting at random and without provocation, would fire on Israeli fishermen plying their trade on the Sea of Galilee or at Israeli farmers in the Hula Valley below. In a costly uphill battle, the Israelis swept out the Syrian defenders and put an end to the harassment. 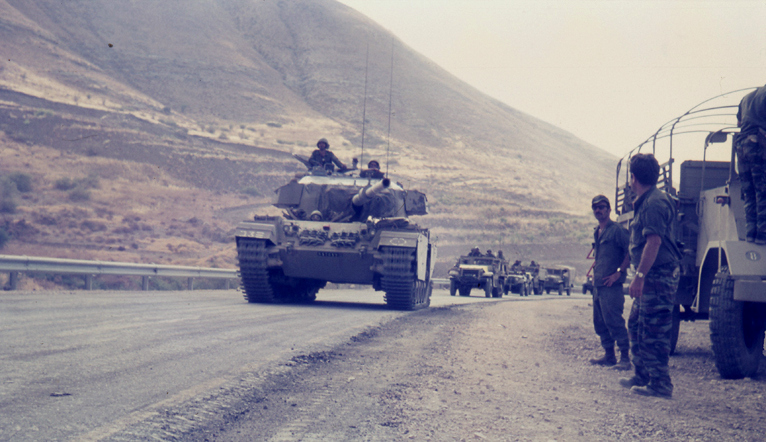 The loss of the Golan Heights in 1967, however, had been humiliating to Syria. 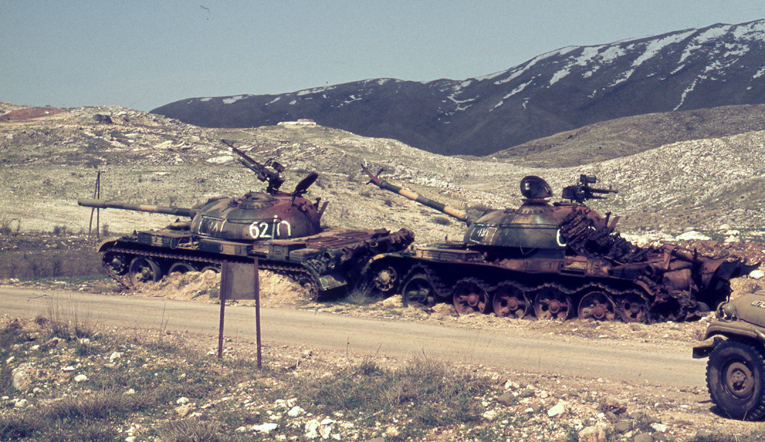 Between 1967 and 1973, there were frequent skirmishes along the cease-fire line. For months leading up to its attack, the Syrian army had been fully mobilized and on war alert. Since the Israelis were accustomed to seeing those forces at battle strength, the Syrians were able to make final attack preparations without sending noteworthy warning signals. Furthermore, with tensions escalating between the two countries, Israeli leadership feared that strengthening its defenses might be misconstrued as preparation for a pre-emptive strike, thus provoking the Syrians to attack. The Golan Heights are made up of a 480-square-mile volcanic (basalt) rock plateau perched above the Hula Valley to the west and Jordan Valley to the south. It rises gently from 600 feet in the south to 3,000 feet in the north, with abrupt escarpments dominating the valleys to the west and south. It is transected in some areas by impassable canyons, limiting the number of routes leading up from the valleys to the heights. 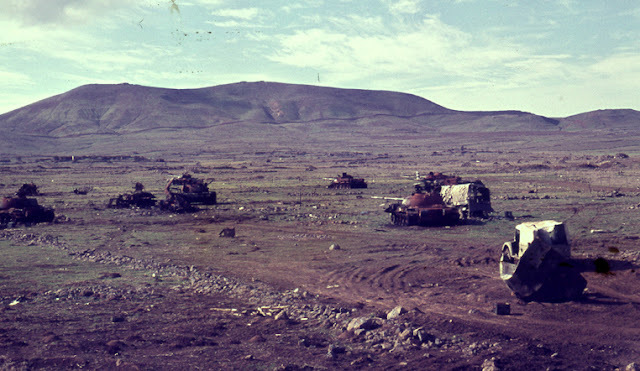 Since the heights' geography restricted defensive mobility, Israel continued its advance against the routed Syrians in 1967 until a defensible line was reached–a string of extinct volcano cones that commands strategic views of Damascus on one side and of all northern Israel on the other. 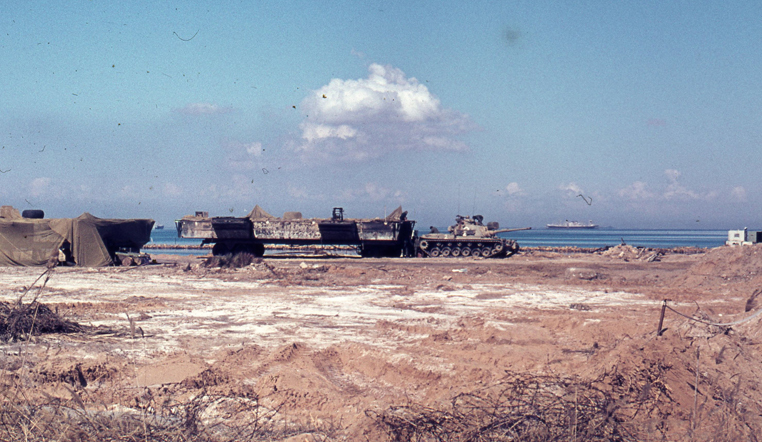 Israeli defenses were based on 17 fortified observation posts. 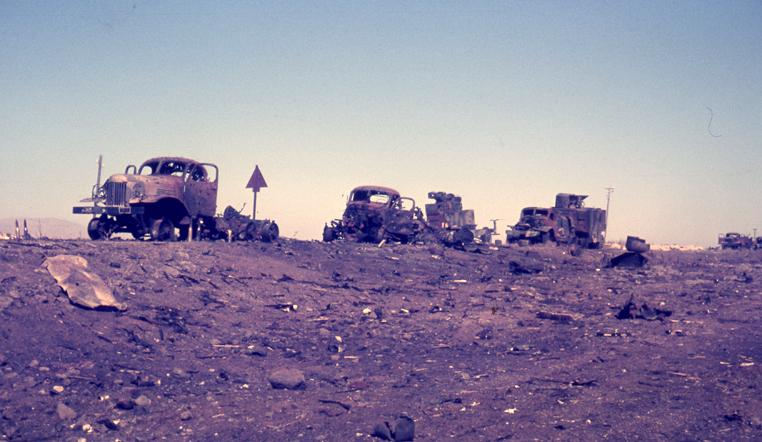 The Purple Line, as the 1967 cease-fire line was known, marked the end of the no man's land separating Syria from the Golan. Lacking a true defensive barrier, the Israelis had dug a 20-mile-long anti-tank ditch along the border from Mount Hermon to Rafid, an obstacle Syrian armor would be forced to cross under fire from Israeli tanks positioned behind ramparts. At the outbreak of hostilities in 1973, the Golan Heights were defended by two armored brigades: the 7th, which had only been dispatched to the northern sector on October 4, and the 188th (Barak) Brigade, a regular fixture intimately familiar with the area's terrain, in the south. The modified Centurion and M-48 Patton tanks fielded by both brigades were fitted with the 105mm NATO gun and modern diesel engines. Considering the faulty Israeli intelligence assessment that, at most, armed skirmishes with the Syrians would break out, the 170 tanks and 70 artillery pieces in the Golan were thought to be enough to meet any Syrian threats, at least until the reserves would arrive. Against that comparatively small force, the Syrian army fielded five divisions for its attack: two armored and three mechanized infantry, including some 1,400 tanks. 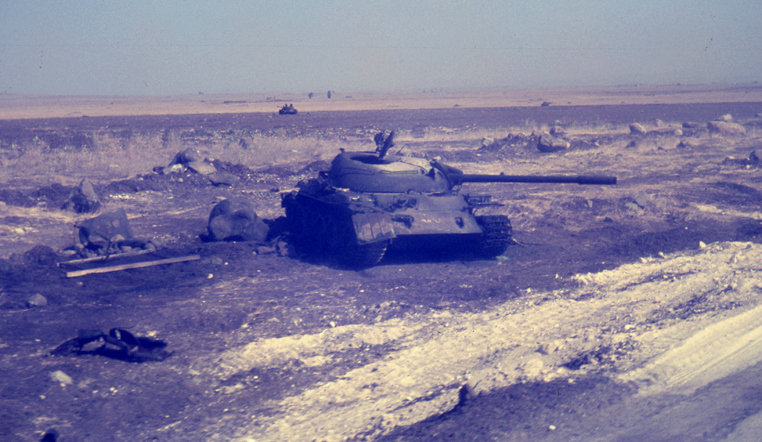 Approximately 400 of those tanks were T-62s, the most modern Soviet-bloc tank at the time, equipped with a 115mm smoothbore gun and infrared night-fighting capability. The balance were T-54s and T-55s armed with 100mm guns. 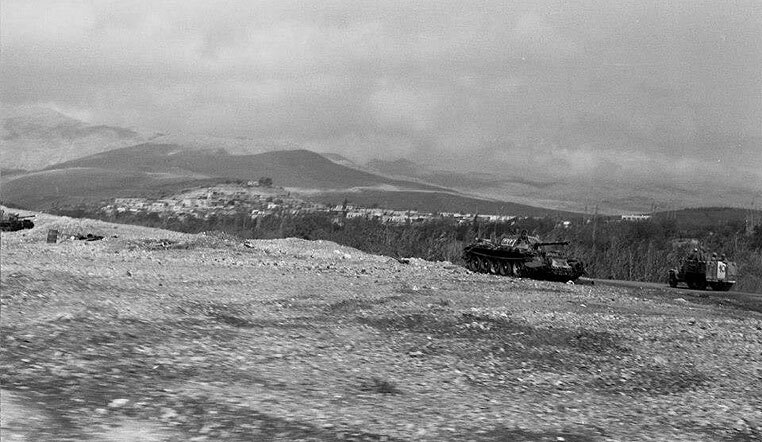 The Syrian plan called for its 5th, 7th and 9th mechanized infantry divisions, in BTR-50 armored personnel carriers (APCs) supported by 900 tanks, to breach the Israeli lines, opening the way for the 1st and 3rd armored divisions to move in with their 500 tanks to capture the entire Golan Heights before Israel had a chance to mobilize. At 2 p.m. on October 6, Syrian gunners opened up a tremendous barrage along the entire front as a prelude to their two-pronged attack–a northern one in the vicinity of the Kuneitra-Damascus road and one in the south where Rafid bulges into Syria. 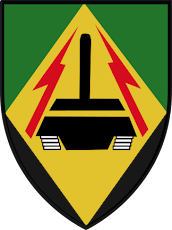 Facing Colonel Avigdor Ben-Gal's 7th Armored Brigade in the Golan's northern sector were the Syrian 3rd Armored Division under Brig. 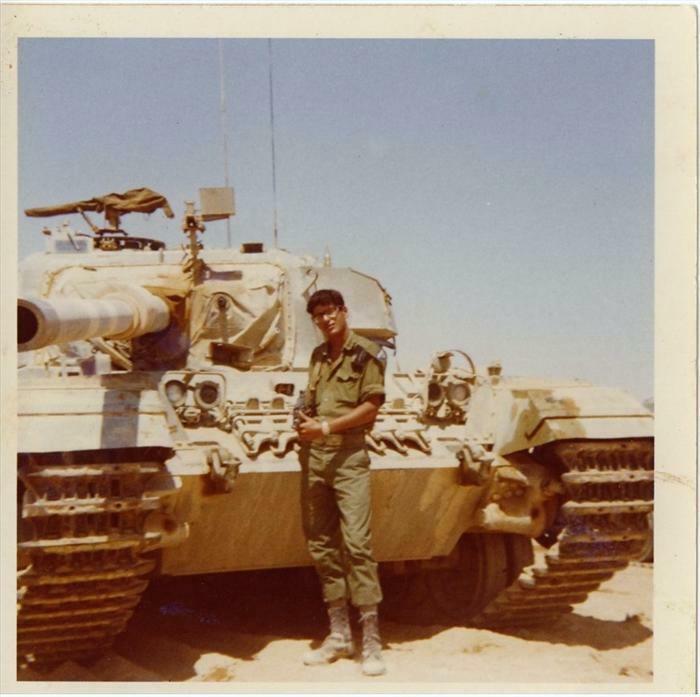 Gen. Mustapha Sharba, the 7th Mechanized Infantry Division and the Assad Republican Guard. 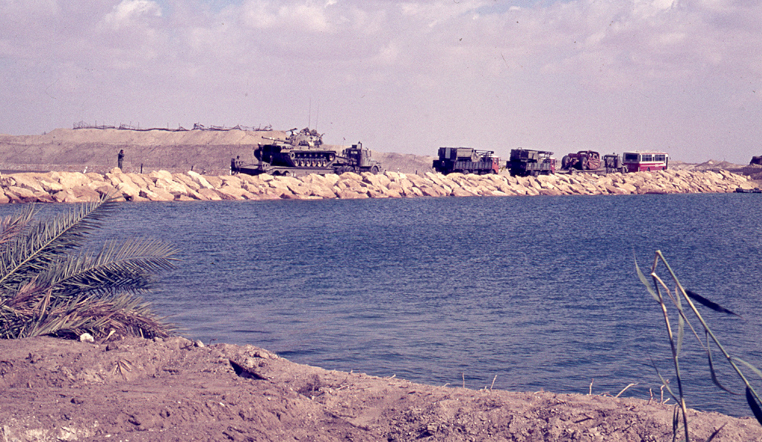 When the Syrian assault began, mine-clearing tanks and bridge-layers led the way to overcome the Israeli obstacles. Naturally, those engineering vehicles were the 7th's first targets, but Syrian infantrymen, braving intense fire from the heights, rushed forward and used their entrenching tools to build up enough earthen causeways for their tanks to negotiate the Israeli anti-tank ditches. While the Israelis took out every Syrian vehicle they could get into their sights, the sheer mass of some 500 enemy tanks and 700 APCs advancing toward their lines ensured that the defenses would be overwhelmed. The number of defenders dwindled as Israeli tanks were knocked out, yet the vastly outnumbered Israelis managed to take a heavy toll on Syrian armor. In spite of their heavy losses, the Syrians pressed their attack without letup, yet the overexerted 7th managed to hold its ground, throwing stopgap blocking actions wherever the Syrians were on the verge of breaking through. When darkness fell, the Israelis had nothing to match the Syrians' night-vision gear and had to allow the enemy armor to advance to ranges effective for night fighting. In the close fighting, the Syrians succeeded in seizing some of the high ground, but a counterattack by the small group of persistent defenders forced them back. 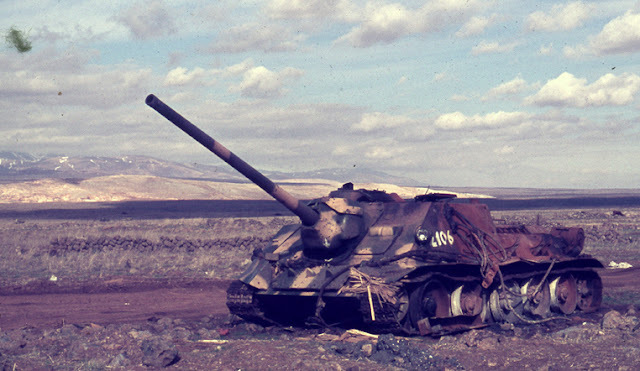 When some Syrian tanks did overrun the Israeli lines, the 7th's gunners would rotate their turrets to destroy them and then immediately turn their attention back to other oncoming tanks. It amounted to an armored version of hand-to-hand combat. The battle raged for two more days as the Syrians, seemingly oblivious to their heavy losses, continued their assault without letup. 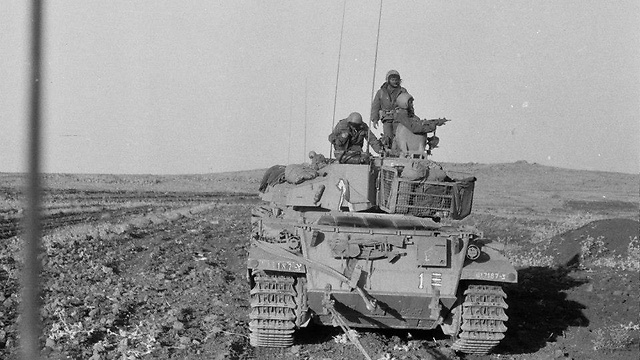 By the afternoon of October 9, the 7th Brigade was down to six tanks protecting what was for all intents and purposes a clear path into Israel's north. Meanwhile, the Syrians, whose objectives included seizing the bridges spanning the Jordan River (most of which could be easily reached through the southern Golan), concentrated a large part of their attack in that sector. Up against hundreds of enemy tanks in a line of armor as far as the eye could see, the Barak Brigade crews had no choice but to hold fast, because the terrain did not allow for much defensive maneuvering. Retreat would give the Syrians nearly free reign to seize the entire heights and move on the Israeli settlements in the valley below. 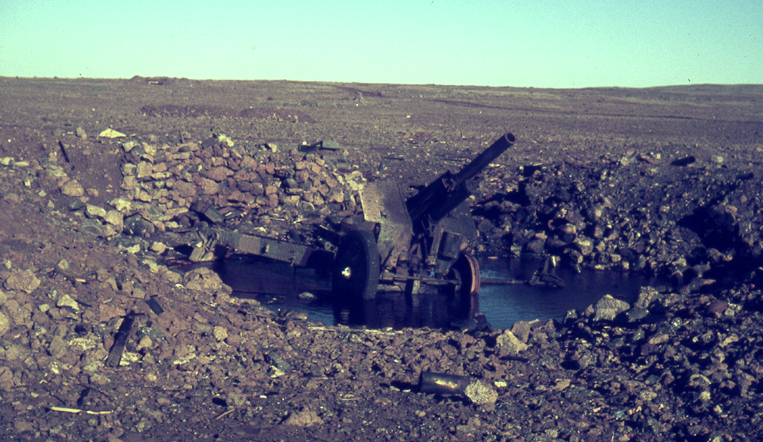 The Syrian advance was initially slowed by an Israeli minefield and by deadly, accurate cannon fire. 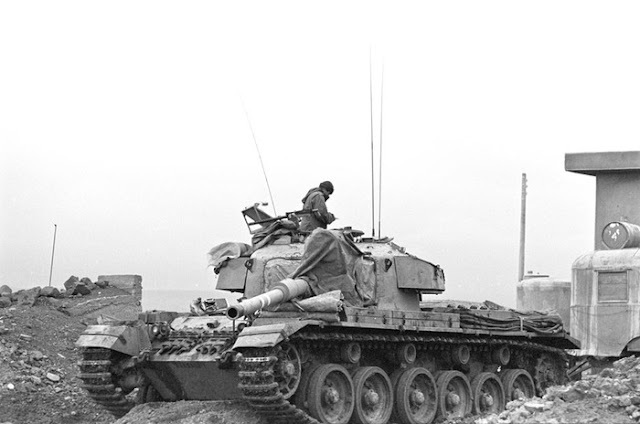 With dozens of Syrian tanks destroyed, the first few hours of the war were encouraging for the Israeli crewmen–their intense training was paying off. 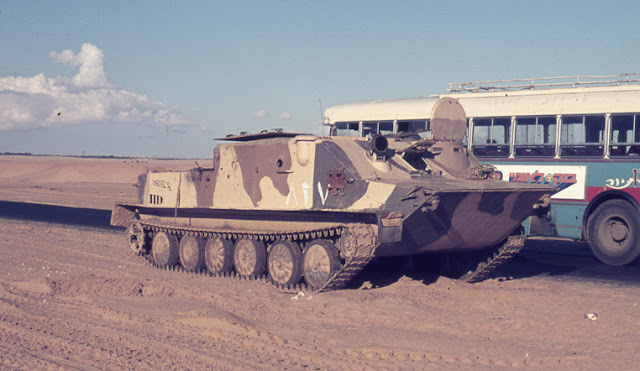 Knowing they would be outnumbered in any engagement, the Israeli tankers had trained relentlessly on gunnery skills and rapid target acquisition to ensure kills on the first shot. Undeterred by their losses, however, the Syrians kept coming, apparently convinced that, if worst came to worst, the mass of their onslaught would ultimately overwhelm the defenders. 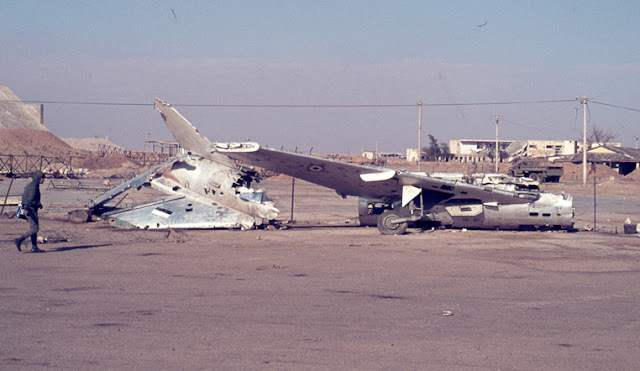 When fighter aircraft were called in to help stem the flow of Syrian armor, many of the Douglas A-4 Skyhawks and McDonnell F-4E Phantoms that responded to the plea were shot down or damaged by the Syrians' dense anti-aircraft umbrella. Aware that Israeli doctrine relied on air power to even the score against the Syrian numerical advantage, the Syrians had acquired massive quantities of the latest Soviet missile and anti-aircraft systems. 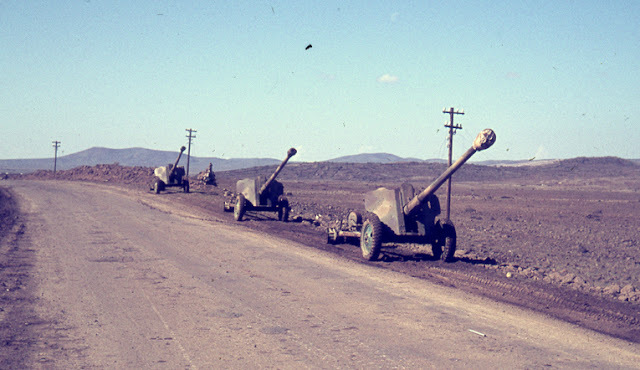 With the help of Soviet advisers, they created an air defense network over the Golan that was thicker than the one protecting Hanoi during the Vietnam War. 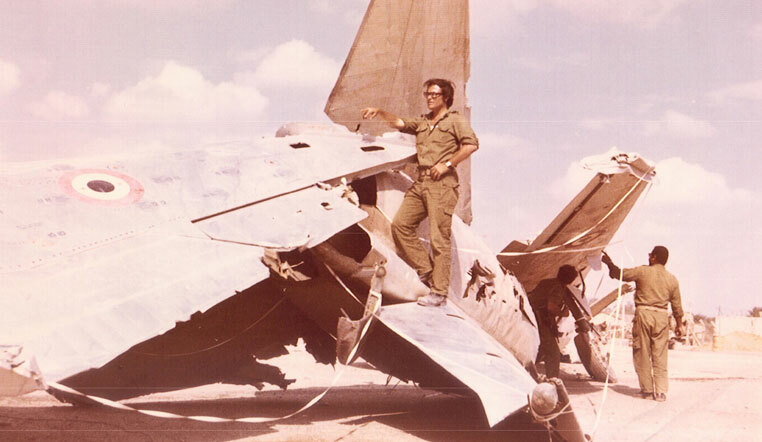 With their air support thus limited, the tankers were on their own–and the fate of northern Israel was in their hands. 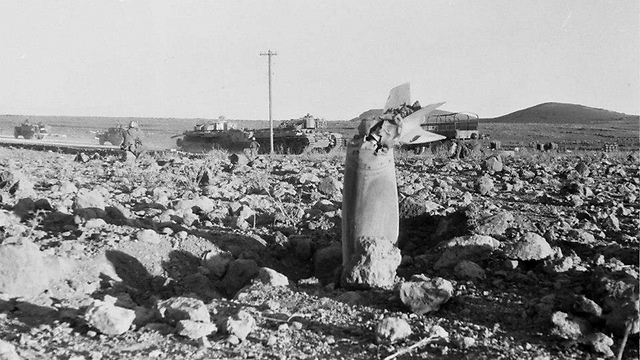 The Israeli tanks stood their ground and were knocked out one by one. Pushed beyond their limits, the defenses in the southern sector broke. Bypassing the Israeli fortifications and pouring through gaps in the defenses, Syrian tanks pushed through the Israeli lines onto a wide-open plain that was ideal for tanks. 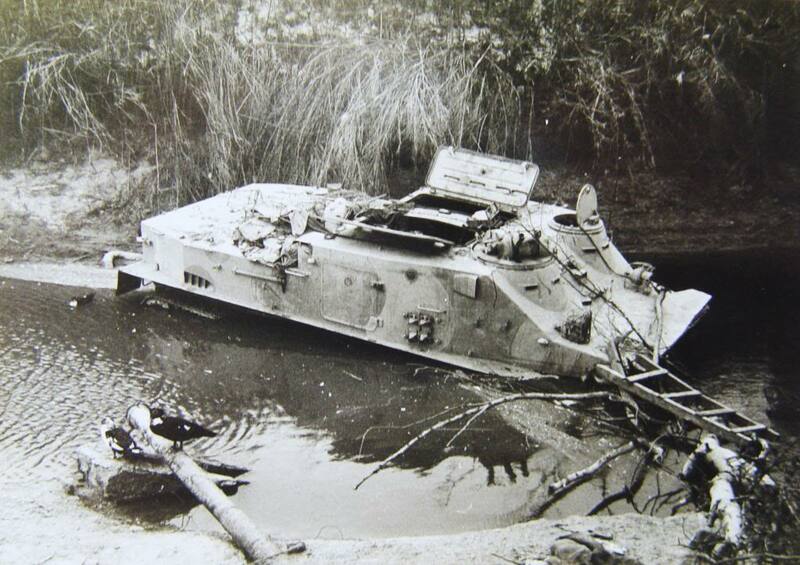 The Iraelis knew that they had to hold on at all costs to allow time for the reserves to mobilize, and in many cases the tank crews sacrificed themselves rather than give ground. 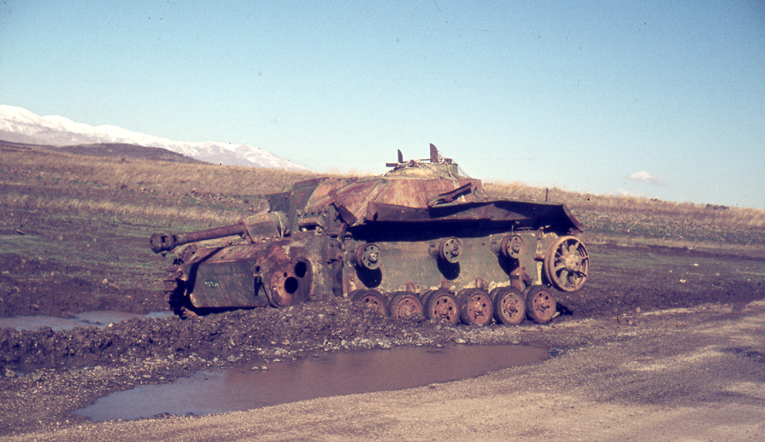 As the hours passed, fewer and fewer Israeli tanks were left to stem the tide of oncoming tanks. The Syrian force split into a two-pronged advance. Colonel Tewfik Jehani's 1st Armored Division moved northward toward the Golan command headquarters of Maj. Gen. Rafael Eitan, situated on the road leading down to the Bnot Yaakov Bridge, over the Jordan River and into the Israeli hinterland. 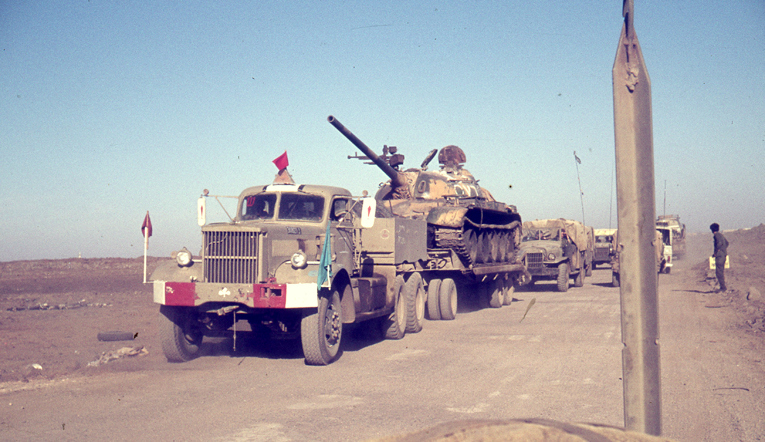 The second prong of the Syrian attack, spearheaded by the 46th Armored Brigade of the 5th Infantry Division, moved south from Rafid on the southern access road toward El Al, with units breaking off toward the north in the direction of the Arik Bridge at the northern tip of the Sea of Galilee. 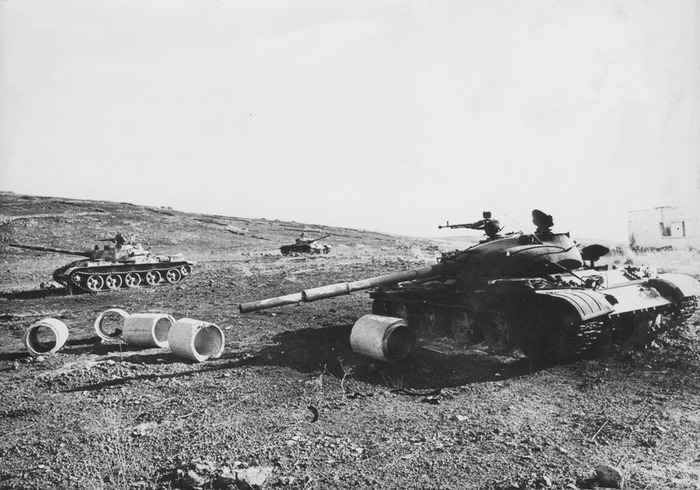 Some 600 tanks were now engaged in the southern Golan, against which stood 12 tanks and isolated units that had been cut off near the various fortifications along the line. Night offered no respite from the Syrian advance as they capitalized on their advantage of sophisticated night-vision equipment. The Israeli crews' long-distance firing efficiency was hampered by their lack of adequate night-fighting equipment. They did their best to overcome this obstacle by ordering illumination rounds to light up the sky, in conjunction with the xenon light projectors mounted on their tanks. Those were no match for the Syrians' infrared searchlights, so the Israelis did what they do best–improvise. 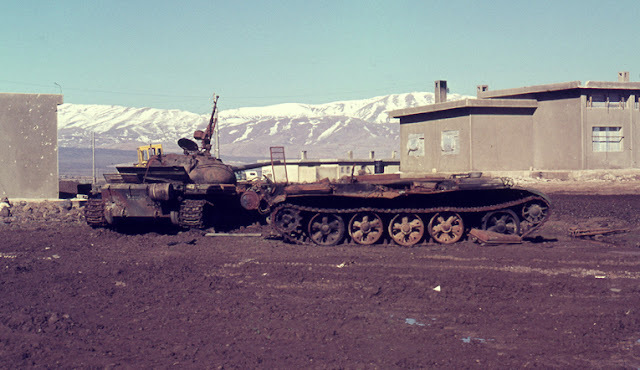 They directed small tank units to carry out stopgap blocking actions against the far superior enemy forces–a tactic that may have prevented the Syrians from overrunning the entire Golan. One of those lethal holding actions that have become legend was led by a young lieutenant named Zvi Gringold, affectionately known as 'Lieutenant Zvicka,' whose hit-and-run tactics are credited with single-handedly holding at bay a major thrust by almost 50 tanks. His guerrilla-style tactics on the route leading toward his brigade's HQ caused the Syrians to believe they were up against a sizable Israeli force. 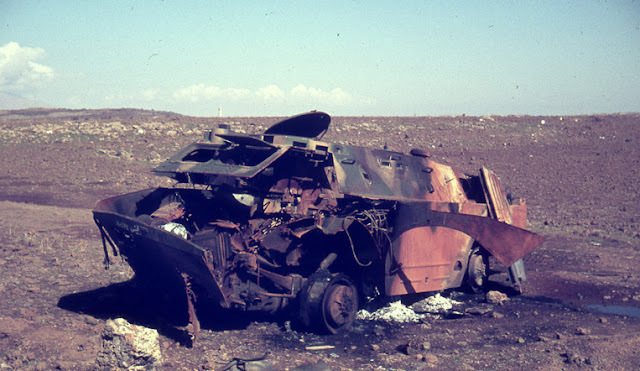 After more than 10 of its tanks were destroyed, the Syrian column withdrew, its commander deciding to hold off and deal with the Israeli force in daylight. Gringold continued to engage the Syrians throughout the night and following day, destroying upward of 30 tanks, until injuries, burns and exhaustion caught up with him and he was evacuated. 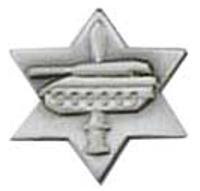 Gringold recovered and was subsequently awarded Israel's highest decoration, Ot Hagvura, for his heroic defense of Nafakh. 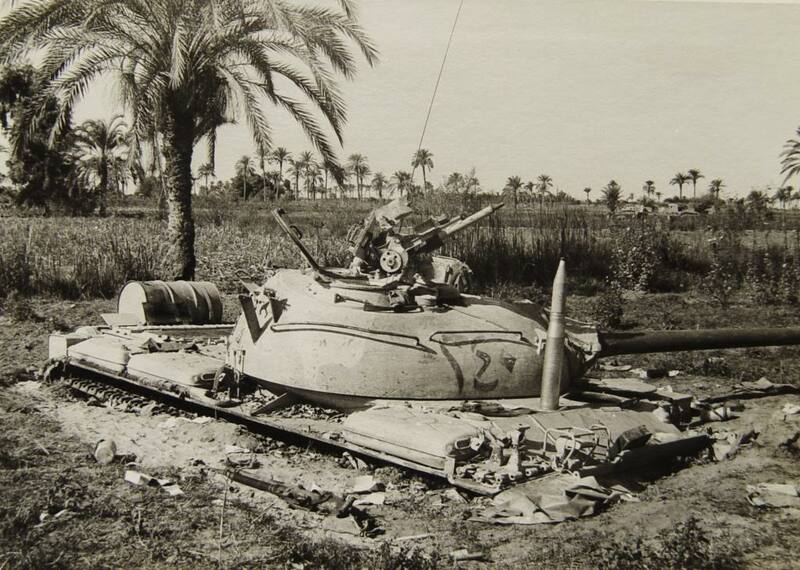 Another blocking force operating in the south, albeit attached to the 7th Brigade, was 'Force Tiger' under Captain Meir Zamir. 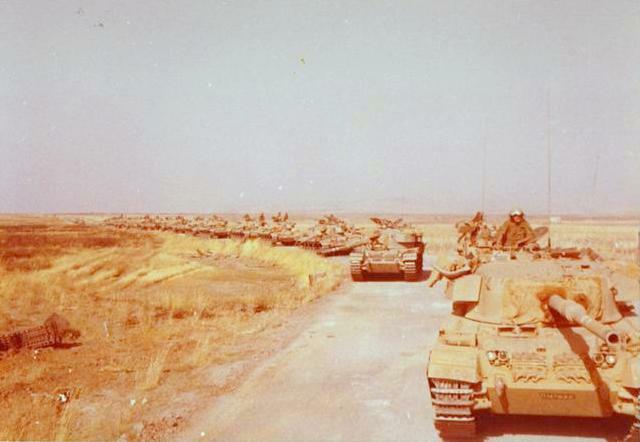 Force Tiger's seven tanks were sent to block a column of some 40 Syrian tanks that had broken through at Rafid and was heading north–a move that threatened to cut off and isolate the 7th Brigade. 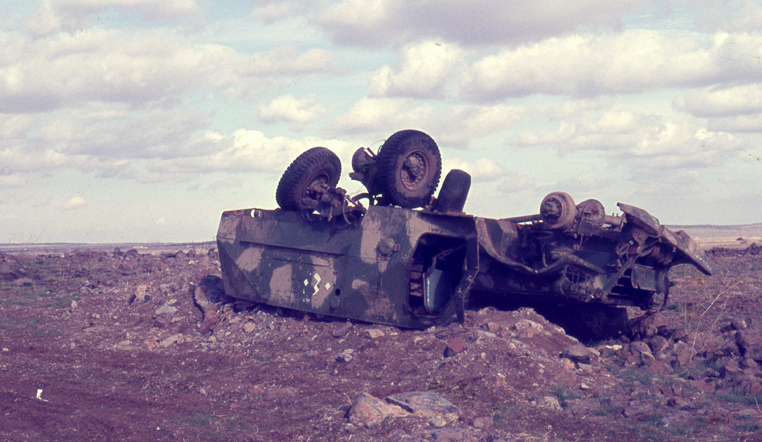 Force Tiger laid an ambush that succeeded in destroying half the Syrian tanks during the wee hours of the morning. 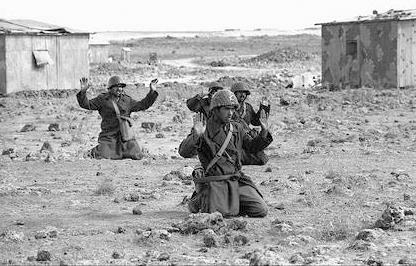 When 20 tanks escaped, Zamir prepared a second ambush that succeeded in finishing off the Syrian battalion just after dawn the next morning. Yet another Syrian thrust by two brigades was advancing rapidly on the southern access road in that wide-open sector and inexplicably stopped short in its tracks just before reaching El Al. While some of its units fanned off toward other objectives to the north, a large part of the Syrian force failed to press its advantage, a move that in effect meant that the Syrians just waited for the Israeli reserves to arrive and engage them. A number of theories abound as to why the Syrians would halt their advance in the midst of their momentum, including fear of an ambush on what certainly should have been a heavily defended route, lack of flexibility and initiative once their objectives had been achieved, overextended supply lines and the more far-fetched fear of an Israeli nuclear reprisal in that critical hour. Whatever the true reason, their lack of initiative at a critical moment robbed the Syrians of the chance to reach the Jordan River–and perhaps beyond–virtually unopposed. In the morning, the Syrians pressed their attack yet again. 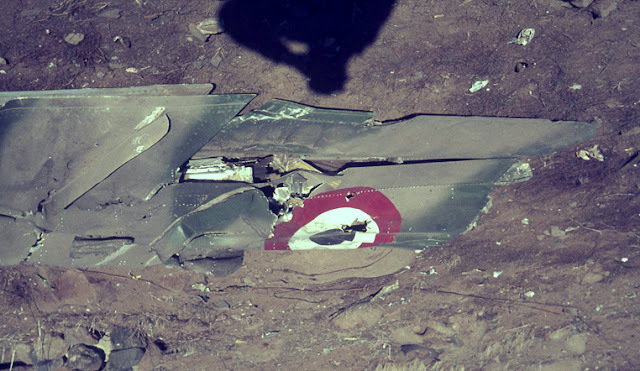 The few remaining defenders of the Barak Brigade pleaded for air support, which again suffered heavy losses. Ironically, the Syrians helped solve the problem of foiling the anti-aircraft missile threat. After the Syrians fired rockets at Israeli civilian areas, the Chel Ha'Avir (Israel Defense Forces/Air Force, or IDF/AF) responded with reprisal attacks on Syrian infrastructure in Damascus and beyond. To defend against these attacks, the Syrians pulled back some of their missile batteries from the Golan front. Overall, it took the IDF/AF several days to develop tactics and gain experience in defeating Syrian air defense systems, and 27 Israeli aircraft were lost on the Golan front in ground-support missions, as well as scores of others suffering various degrees of damage. 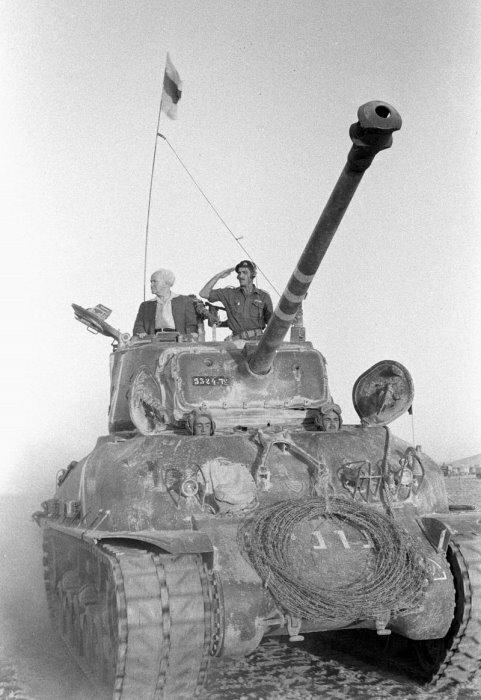 On the morning of October 7, Minister of Defense Moshe Dayan toured the Golan front and recognized how critical the situation truly was. Not only were the access routes into the Golan threatened, but also the entire north of Israel. Grasping the very real prospect of a Syrian breakthrough into integral Israel, the minister of defense considered a retreat to a line just forward of the escarpment overlooking the Jordan Valley for a major defensive stand–in effect putting his forces' backs against a wall. Israel prepared to destroy the bridges over the Jordan River to prevent a Syrian breakthrough. 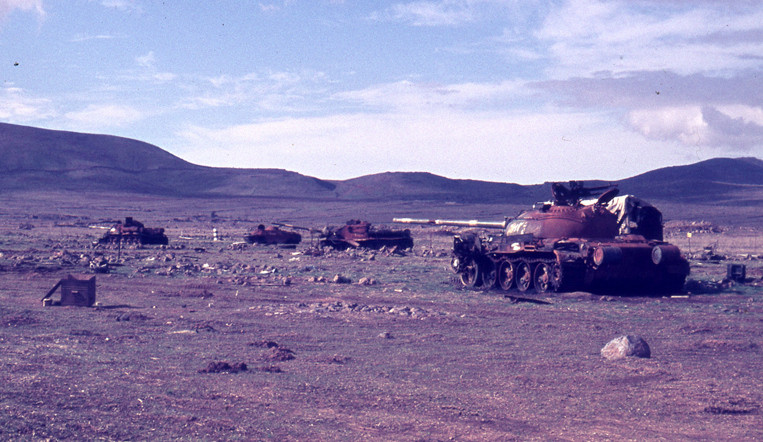 The Syrian 1st Armored Division was advancing up the route toward the Golan HQ at Nafakh. 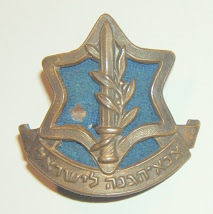 Colonel Yitzhak Ben-Shoham, the Barak Brigade's commander, realized his brigade was for all intents and purposes destroyed. He therefore organized and led a small group of surviving tanks in a holding action that slowed the Syrian advance on his HQ for several hours until he and the rest of the defenders were killed. With the brigade commander dead, no reserves in sight and two Syrian brigades advancing toward the Golan HQ–and with some units having bypassed the base on both flanks–the situation could only be described as grave. Lead elements of the Syrian brigades actually reached Nafakh and broke through the base's southern perimeter. One Syrian T-55 crashed into General Eitan's HQ, only to be knocked out by the last operational tank in Gringold's platoon. At that point, Eitan evacuated his headquarters to an improvised location farther to the north. 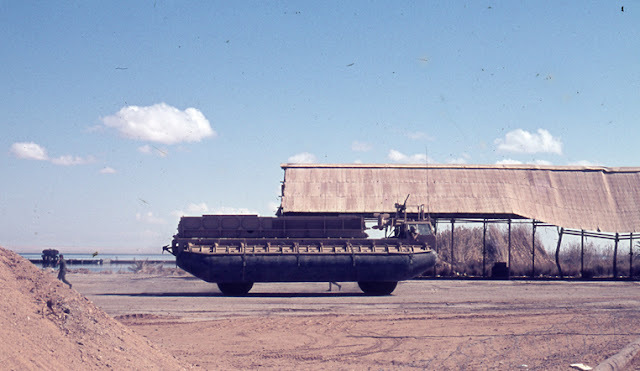 Those left to defend the base manned two trackless Centurions from the camp repair depot and fired bazookas in a final stand that knocked out several Syrian tanks until those last Israeli tanks were destroyed. 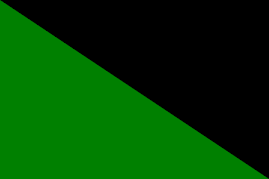 The 188th Barak Brigade was no more. 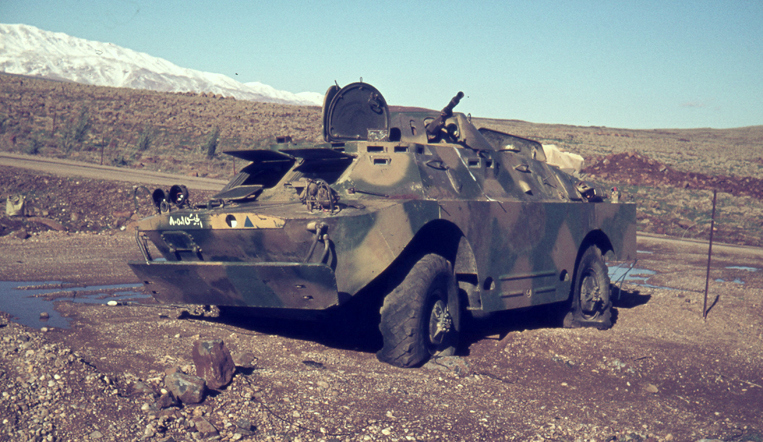 The Syrians were poised to overrun the Golan headquarters at Nafakh and, seemingly, the entire Golan. That final stand, however, was enough to buy a few crucial additional minutes. 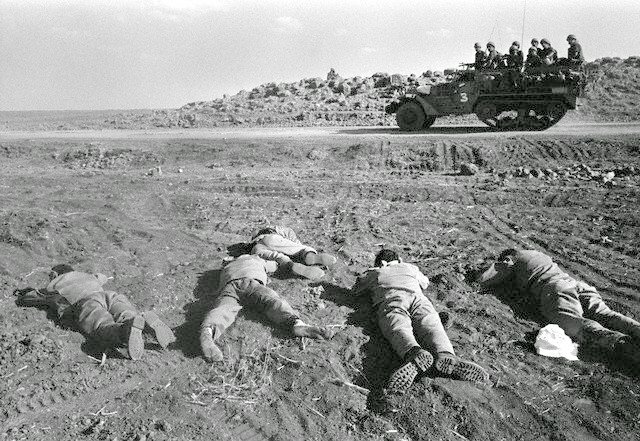 While the Syrians paused to regroup after their final opposition had been neutralized, the first Israeli reserve units began reaching what had become the front lines. 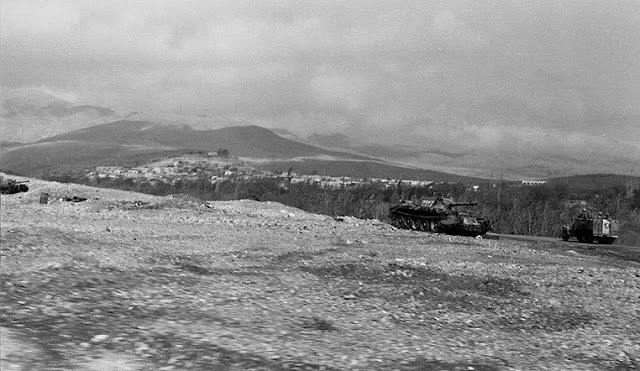 Finding Syrian tanks milling about their command headquarters, the Israelis immediately opened fire and attacked, dispersing the Syrians. The arrival of the Israeli reservists spelled the beginning of the end for Syria. 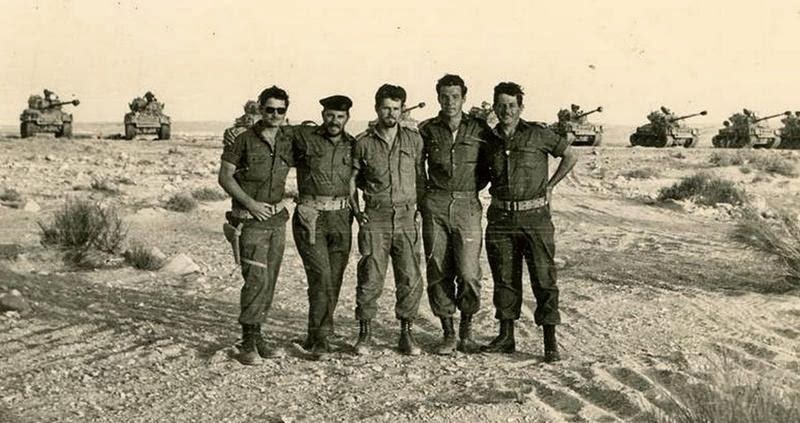 For both sides, the war had been about time–the Israelis doing all they could to buy time until their reserves arrived, and the Syrians racing against the clock to achieve their objectives before the Israeli mobilization. 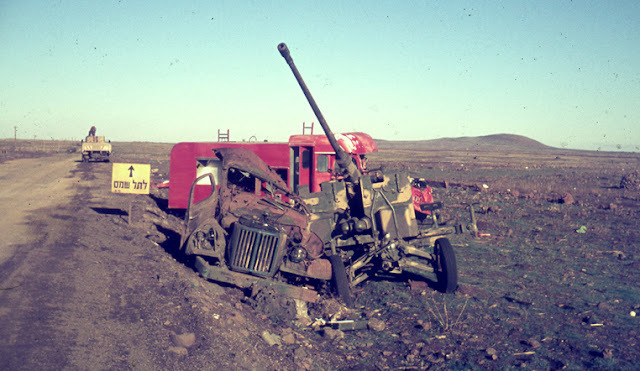 While many more bloody battles would take place, those first reserve units coming up the Golan and engaging the Syrians at Nafakh meant that the tide had turned. The reservists found the Syrians enjoying nearly free reign in the Golan's southern sector. With Syrian tanks advancing along the routes down toward the Jordan River, the critical situation allowed no time to organize divisions and brigades. Instead, platoons and companies of tanks and other units were rushed off to battle as quickly as the forces could be mustered, at times being thrown in against Syrian battalions and even brigades. The fresh Israeli reserve units halted the near–and, in some cases, actual–retreat of what remained of their front-line forces and set about checking the Syrian advance. 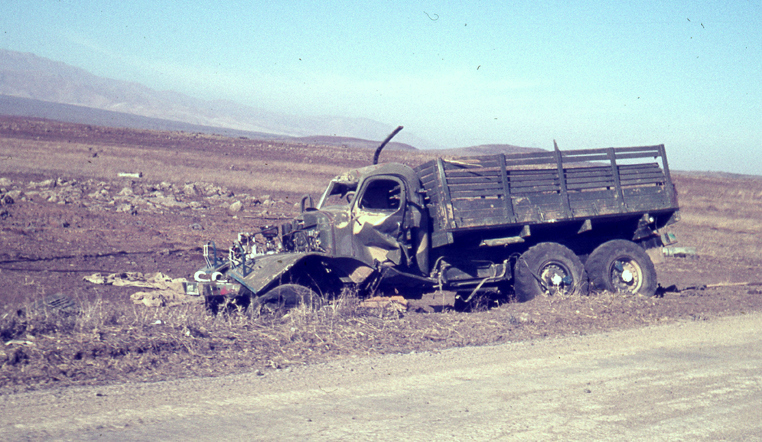 By midnight on day two of the war, the reserves had managed to stabilize what had been a disintegrating front–with the Syrians having penetrated to areas a mere 10-minute drive from the Jordan River and Sea of Galilee and to less than a kilometer from El Al on the southern access road. Those gains had not come easily. In spite of their superior numbers, the Syrians' supply lines, extending great distances from their rear areas to points deep into the Golan, had been decimated by the Israeli defenders, and they could no longer replenish and support their forces. Convoys of supplies and reinforcements were under constant attack by the IDF/AF, as well as IDF armor and other ground forces, severely straining the Syrian advance. While the Syrians dug in to consolidate their gains, the Israelis went on the offensive. 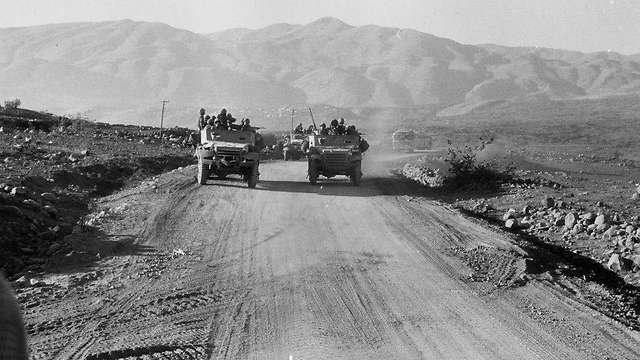 Brigadier General Moshe Peled led a division up the Ein Gev road into the center of the southern sector while Maj. Gen. Dan Laner's division moved up the Yehudia road farther to the north–a parallel advance that boxed in the 1st Syrian Armored Division and effectively brought the Syrians' brief conquest to an end. The Syrians fought viciously to free themselves from that pincer movement. A major confrontation near Hushniya camp, which the Syrians had captured the previous night and turned into a forward supply base, ended with hundreds of wrecked, burning and smoldering Syrian tanks and armored vehicles and other vehicles littering the landscape. By October 10, the Israelis had forced the Syrians back to the antebellum cease-fire line in the southern sector. Well aware of the strong Syrian defensive preparations in the south, Israel chose the northern Golan, with its more difficult, less-defended terrain, as the launching area for its counterattack into Syria itself. 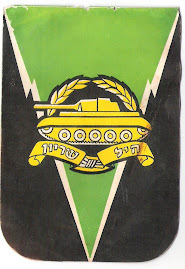 Among the units joining the counterattack was the reincarnated Barak Brigade. Since 90 percent of its original commanders had been killed or wounded, Barak's remnants were joined by replacements, reorganized and returned to fighting strength for the counteroffensive that penetrated deep into Syria–until a United Nations-sanctioned cease-fire came into effect on October 23, officially ending hostilities. 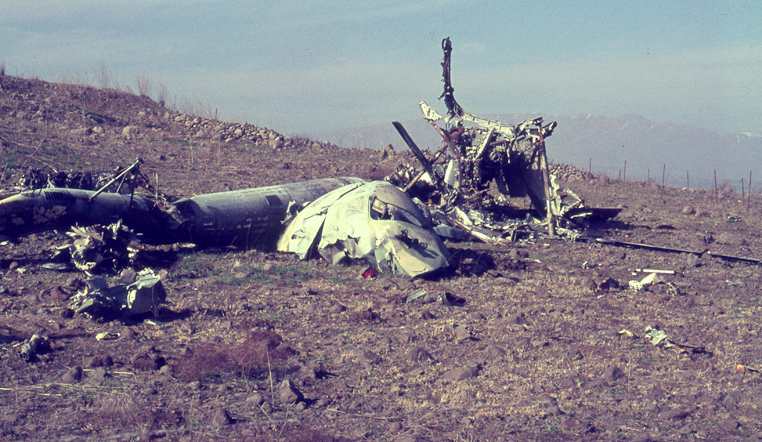 Although the war ended with Israeli forces on the move toward the Syrian capital, the Yom Kippur War–or Ramadan War, as it is known to the Arabs–shattered the myth of Israeli invincibility. 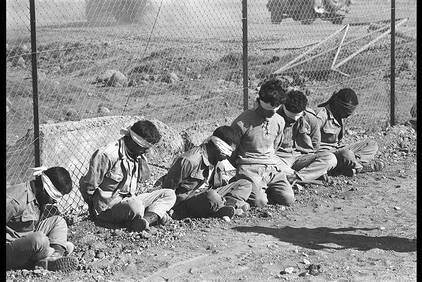 The Syrians' success in maintaining the element of surprise and its forces' discipline in executing its attack helped that country regain much of the honor it had lost in the debacle of 1967. The victorious Israelis, on the other hand, had won a Pyrrhic victory. Horrible losses had been suffered, epitomized by the obliteration of the 188th Barak Brigade. 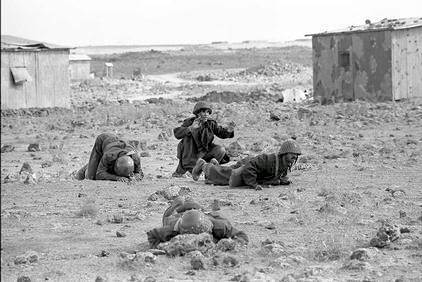 While the war reaffirmed the Israeli defense doctrine of relying on the reserves' arrival within 24 hours to defeat a numerically superior enemy force, there was no time for celebration as the country buried the 2,222 soldiers who had paid the ultimate price for their country's survival and attended to its 7,251 wounded. This article was written by Gary Rashba and originally published in the October 1998 issue of Military History magazine.